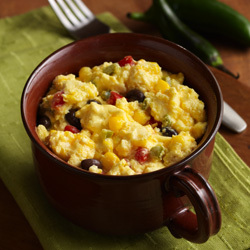 For a take-with breakfast, wrap scrambler in a warm tortilla. No pickled jalapenos on hand? Substitute a little ground red pepper. The scrambler puffs up and fills the mug while cooking. It falls quickly once removed from microwave. Use a large (15-ounce) microwave-safe mug to hold the ingredients and to reduce the chance of overflow. Mugs that are wider and shorter work best. A 2-cup glass measure may be used as well. Microwave wattages vary; adjust cook time as needed. Cook the scrambler just until the egg is set. For gluten free preparation, confirm all recipe ingredients are gluten free by reading product labels each time you make this recipe. To get full nutritional info and other ideas, check out the Ready-Set-Eat link.